Two months after the Allied military victory in Takistan, the new government is restoring the war-torn country. NATO forces assisting in this effort face the threat of insurgency, waged by the remnants of the defeated Takistani army in the mountaineous regions of Takistan. Company team of British paratroopers patrolling the treacherous mountains in Zargabad\'s vicinity is ordered to battle the amassing guerilla warriors. 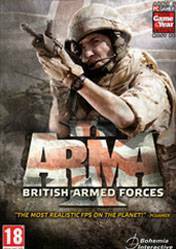 There are no comments yet about Arma 2: British Armed Forces . You can be the first one!